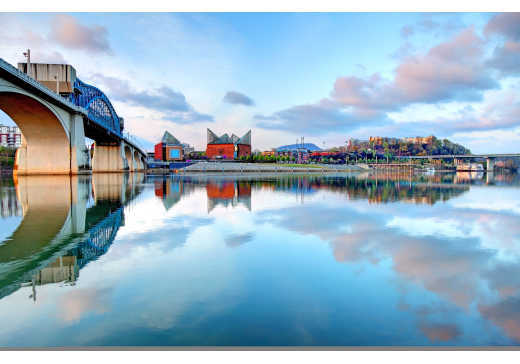 Whether it&apos;s spring break, summer vacation, or just a long getaway, Chattanooga is the perfect place for your next trip! If you&apos;re trying to decide what to do on a week-long vacation to the Scenic City, check out some of these top rated attractions, outdoor adventures, and family-friendly activities. You simply can’t spend a week in Chattanooga and not visit the Tennessee Aquarium. Explore the River Journey and Ocean Journey buildings to see a variety of animals like Red-ruffed lemurs, Macaroni penguins, and plenty of fish and reptiles. Once you&apos;ve explored the Secret Reef and Lemur Forest, check out the IMAX 3D Theater to see some of the sharpest, brightest, clearest and most vivid digital images ever seen. Next, head up to Lookout Mountain for a visit to Rock City, Ruby Falls, and The Incline Railway. All located within a five mile radius of one another, each attraction offers something totally different. At Rock City, you&apos;ll enjoy scenic views from the Seven States overlook, lush gardens, and trails lined with giant boulders and rock formations. A visit to Ruby Falls is well-worth it, as you&apos;ll see the largest underground waterfall open to the public - it&apos;s over 140-feet tall! Over at the Incline Railway, you&apos;ll soak in the views from America&apos;s Most Beautiful Mile as you ride up the side of Lookout Mountain. If you&apos;re looking for ways to get on the Tennessee River, a cruise aboard the Southern Belle Riverboat or the Chattanooga Ducks allows you to see the city from a different angle. Once you&apos;re back on land, a visit to the Creative Discovery Museum is a great escape for kids of all ages. Kids can enjoy the two-story water play section, check out an archeological dig (complete with dinosaur bones), explore the seasonally rotating exhibits, take a cooking class, and even create their own art. If you find yourself on the North Shore, stop by Coolidge Park to play in the water fountains, ride on the 100-year-old antique carousel, and taste some hand-crafted ice cream from Clumpies Ice Cream Co. Get there from downtown via the Walnut Street Bridge, one of the longest pedestrian bridges in the world, or by the free electric shuttle. 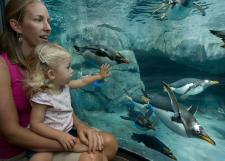 For the animal lover in the family, It’s a safe bet that the Chattanooga Zoo will be a crowd pleaser. See your favorite animals like red pandas, snow leopards, jaguars, and the new tamarin exhibit. If you visit on the weekend, don&apos;t miss your chance to take a ride on a camel! For music and art lovers, the Scenic City has lots of places to explore. Be sure to visit the Bluff View Art District to check out the sculpture garden or enjoy a sweet treat from Rembrandt&apos;s Coffee House. Up on the bluff, you&apos;ll also find the Hunter Museum of American Art. Explore the historic Hunter house and enjoy the variety of exhibits that change throughout the year. For the music lover, your trip won&apos;t be complete without a visit to Songbirds. This one-of-a-kind museum is home to over 500 rare and vintage guitars that include acoustic, electric, jazz, bass, mandolin, banjo, and mandocello models. The collection is complete with unique Fender, Gibson, and Les Paul models, even a few guitars that date back to the 1940s! If you&apos;re feeling adventurous, make sure to visit High Point Climbing and Fitness for an experience you won&apos;t soon forget. The little ones will love the Kidzone where they can climb on top of buildings, race to the top, or just practice their climbing skills. 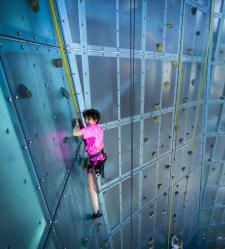 Outside of the Kidzone, you&apos;ll find plenty of top-rope climbing walls, bouldering sections, and an outdoor climbing wall where you can scale the building. INSIDER TIP: Many hotels offer vacation packages and special deals that include tickets to local tourist attractions. If possible, time your trip with one of Chattanooga’s awesome events. If you&apos;re visiting in the summer months, there&apos;s no shortage of things to do in the Scenic City. A Chattanooga Lookouts baseball game (April-September) is the perfect way to unwind on a warm spring or summer night. You&apos;ll also find plenty of live music and festivals like Nightfall (May-August), Riverfront Nights (July-August), and Riverbend (June), one of Chattanooga&apos;s premier live music events. This 8-day music festival features five different stages where you&apos;ll find big-name headliners and local favorites alike. If you love to shop local, the Chattanooga Market is the place to be. You&apos;ll find fresh produce, locally crafted art, food trucks, and live music each Sunday (April-November) at the First Tennessee Pavilion. If you&apos;re traveling with a history buff, there are plenty of places to explore in Chattanooga, including the sites of two crucial Civil War battles and origin of the Trail of Tears. Just outside of downtown, you can travel back in time at Chickamauga Battlefield. A 20-minute movie, cell phone audio tour, and park ranger tours are all free. Guided tours are at 10 a.m. and 2 p.m. (every day during spring and summer; weekends in fall and winter). 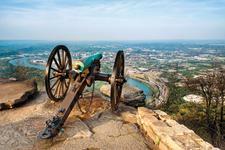 Up on Lookout Mountain, you can walk the grounds of the “Battle Above the Clouds” at Point Park. Besides beautiful views and picnic spots, the Visitor’s Center houses a large mural by James Walker, an eyewitness to the battle in 1863. If you&apos;re walking along Chattanooga&apos;s riverfront, you can&apos;t miss The Passage, the area that marks the beginning of the Trail of Tears. Here you&apos;ll find a &apos;weeping wall&apos; that represents the tears shed as the Cherokee were driven from their homes, seven ceramic disks that tell the story of the Cherokee Nation, and 14-foot tall stainless steel sculptures of stickball players. In the summer, The Passage steps are flowing with water, making it a perfect place to cool off on a warm day. The Tennessee Valley Railroad Museum brings history to life with their numerous rail excursions, which range from 45 minutes to 6 hours depending on the route. Kid-friendly rides include the Missionary Ridge Local (a 55 minute ride), the Hiwassee River Rail Adventure (a 3 ½ hour ride from the Etowah station, located an hour north of downtown) and the North Pole Limited (a holiday themed, pajama friendly ride that includes a visit from St. Nick in December). Chattanooga is the perfect outdoor escape. You&apos;ll find world-class rock climbing, hang gliding, hiking, whitewater rafting, and more outdoor adventures that the whole family can enjoy. The Glen Falls Trail on Lookout Mountain is perfect for any age. It’s about 10 minutes from downtown, has very little elevation change, and is less than a mile’s walk to an enchanting waterfall, rock tunnel, and wading pool. Head to the other side of the mountain for a visit to Reflection Riding Arboretum & Nature Center which offers 317 acres of dense forest to explore. 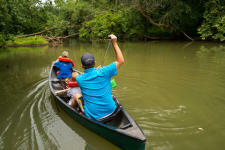 You can paddle down Lookout Creek, visit the Wildlife Wanderland for a possible glimpse of a bobcat or red wolf, or ride/walk the three-mile Reflection Riding Loop. For an adventure that can be found above ground and below ground, check out Raccoon Mountain. Up top you&apos;ll find beautiful views of downtown and miles of hiking/biking trails around its breathtaking reservoir, a 1.2-mile manmade lake that powers the Pumped Storage Plant. Underground, you can explore over 5.5 miles of passageways, dozens of 100% natural formations along the lighted walking trail in the Crystal Palace room, and even a few bats and salamanders. For those that like to soar, Chattanooga is home to the largest hang gliding school in the world! At the Lookout Mountain Hang Gliding & Flight Park, you can fly tandem for a one-time thrill or take lessons and learn to fly like an eagle. Kids as young as 4 years old are welcome to try this adventure. From cabins, to bed and breakfasts&apos;, to luxury accommodations, there are plenty of options for places to stay in Chattanooga. If you need a little extra room to spread out, check out a Chattanooga cabin nestled on the banks of the river or Lookout Mountain. If luxury is more your style, a stay at the Westin Hotel or the Chattanoogan Hotel will be perfect. Find a full list of hotels and accommodations in Chattanooga here. For more things to do in Chattanooga and to plan your next visit, click here.